SALT RIVER, Arizona -- It certainly wasn't by choice, but Rob Zastryzny worked with two catchers in his fifth start of the Arizona Fall League season. What came out of it was his best outing of the year. One start after taking his first loss, the Mesa left-hander got his inaugural win and posted a scoreless start for the first time since July 23, 2014, allowing just one hit and one walk while fanning three over five innings as Solar Sox edged the Salt River Rafters, 4-2. 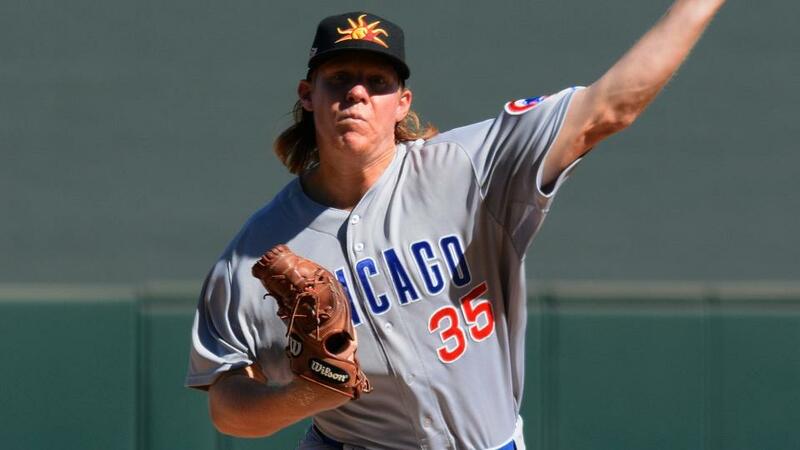 Zastryzny was in a groove through two innings when his fellow Chicago prospect Willson Contreras was injured trying to beat out a double play in the top of the third inning. The catcher, the Cubs' No. 10 prospect, reached to grab his hamstring and fell after crossing first base, later walking off the field under his own power with members of the Mesa staff. Contreras gave way to Stephen McGee (Angels) in the bottom of the third, but Zastryzny didn't struggle with the swap. "They did well together," Zastryzny said. "I talked to McGee before he came in and told him what we were doing, and he kind of worked off that. I've been working with Willson pretty exclusively, and he's done a great job. He's a fantastic ballplayer." Contreras remained in the dugout with the Solar Sox after the injury. "He walked back on the field and looked fine," Zastryzny said. "He was walking around talking to the guys, so it was really good to see that." The only hit the Cubs' No. 25 prospect allowed was a two-out single by No. 21 Nationals prospect Spencer Kieboom in the first. L.J. Mazzilli, the Mets' No. 23 prospect, walked to lead off the third before Zastryzny retired the final nine batters he faced. The southpaw had not posted a scoreless start since going six shutout innings in a win for Class A Advanced Daytona over 15 months ago. This year, he reached Double-A for the first time, but struggled to a 2-5 record and 6.23 ERA in 14 starts for Tennessee. Despite the numbers, the Southern League exposure prepared Zastryzny for the competitive level of the AFL. "I couldn't imagine coming straight from high-A," he said. "The jump from high-A to Double-A was huge for me. I feel like the jump from high-A to here is unbelievable. The zones are smaller. The guys hit better. You're facing guys who could easily be in the big leagues tomorrow. Those guys who went straight from high-A are doing a great job. I think going from Double-A to here is a little bit of an adjustment, but it's a lot easier." Mesa rolled up 12 hits in the victory, but went just 2-for-14 with runners in scoring position. Miami's No. 6 prospect Austin Dean led the way with a triple and a run scored. Salt River starter Jeremy Gabryszwski (Toronto) fell to 1-1, charged with two runs on five hits over five innings. For Zastryzny, the outing provided a blueprint for a strong finish to 2016. "If you watch a big league game, they do that," he said of being able to mix locations. "They work in, work away, back in. That's just the consistency. Minor Leaguers, some days they don't have their curveball or some days their changeup isn't there. That doesn't happen much in the big leagues, so they can do that. If you're able to control all your pitches, you might as well use it, right? That's definitely something I can work on in the future. It was kind of enlightening for it to happen to me tonight."